Community leaders Thobile Mvabaza and Mthetho Mahlakahlaka outside the newly-built community hall in Nquma village. “The municipality knows we are desperate for this hall but we are told to wait,” says Mahlakahlaka. 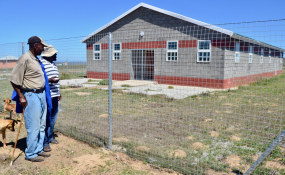 Villagers of Nquma in Peddie, Eastern Cape, have been using a sheep shed for community meetings, while a newly-built community hall has stood empty and locked up since August 2018. Residents say they have been begging Ngqushwa Local Municipality to hand over the hall to them. They were told to wait for the official opening. Ngqushwa Local Municipality spokesperson Ncumisa Cakwe could not say why the hall had not been officially opened yet, but said it will be handed over to the community before the end of financial year in June. Community leader Thobile Mvabaza said they have been waiting since 1995 for a community hall. "We would donate money from our pockets to send people to Bhisho to speak with the officials to build a community hall for us. If I remember correctly, there was a time when R10 was collected from each house to transport us to Bhisho to beg government to build us this hall," said 77-year-old Mvabaza. "Now that the hall is built after 24 years, we are told to wait for an official hand over!" Mvabaza growled. Last month the community arranged for a mobile clinic to visit the village. "Nurses had to attend to people in that sheep shed. Yes, we cleaned it, but that is not an environment to treat sick people," said Mvabaza. He said there were many things for which the community needed the hall. Community leader Mthetho Mahlakahlaka said, "The sheep shed is not big enough for this community ... When it rains we are forced to postpone our meetings no matter how important they are because the shed leaks."